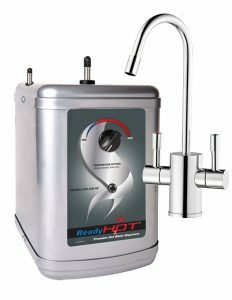 Ready Hot RH-200-F560 is a modern stainless steel hot water dispensing unit that comes with a chrome or brushed nickel dual lever- hot and cold faucet. Chrome faucet version RH-200-F560-CH costs roughly 40 bucks more than the brushed nickel one (RH-200-F560-BN) at the time of this review. You will enjoy the convenience of having direct access to 190F degree hot water, with its 1300 watt instant hot water reservoir that delivers 60 cups of water each hour. You will not be wasting any water or energy as you will be using only what you need. It has the security features like the auto protection of heater that stops tank burnout if you start it dry. The stainless steel tank has a 2.5-quart capacity and includes a chrome or brushed nickel cold and hot dual lever faucet. It is cheap and easy to maintain. 190 degrees Fahrenheit is almost boiling water temperature and you can make your tea, coffee, hot chocolate, instant noodles, porridge, pasta, soup, and veggies. You can clean pans and pots or warm baby food or bottles with the hot water. Ready Hot RH-200-F560 weighs 13.8 pounds and measures 11 x 8 x 12 inches. The widest part of the faucet is 5 inches wide from handle to handle and it is 11 inches tall- tall enough to fill a good size thermos. The cold tap stays on when you push it in so you don’t have to hold it while getting water. But the hot tap has a built-in security feature that needs you to hold it (push down on the red button) while you’re filling your container with hot water. There is a bit of a delay (like 4 seconds) before the hot water is dispensed but comes on strongly. So if you don’t want it to shoot out, just move the handle slowly and a little, as you don’t want nearly boiling water coming out fast and cause burns. 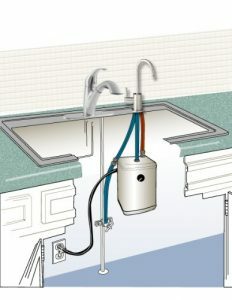 You get the normal water pressure on the cold water faucet if you wish to connect a chiller. It is like filtered water and works a little slower than a standard faucet as you can imagine. The unit comes with the power cords and the heater will be plugged into a regular 110 Volts under the sink outlet and you will not need anything extra or special. If you have steam along with a bit of noise of boiling water from the faucet, it is probably because you have it at the highest setting and you may want to turn down the dial a little. Ready Hot RH-200-F560 is relatively easy to set up and comes with the water lines but please note that each installation will be slightly different. You will have each access to hot water to use for your tea, coffee or whatever you want to make. And you do not need to wait for the water to boil in a kettle or a teapot. It is solid, durable, functional, convenient and reasonably priced for what it is. Good value for money when you compare it with the competitor brands and models.